When chosing our favourite holiday-destinations, Germany mostly does not rank on one of the first positions. Generally, warm countries like France and Spain are more popular destinations. However, around christmas we all love to visit Germany for its gorgeous chistmas markets. The atmosphere is unique and there is no other country in Europe which has as much christmas markets as Germany. Partly for this reason, Germany is one of the better holiday-destinations to spend your free days in December. Already since halfway the 20th century Germany has been the home of the christmas markets. Compared to many other countries, the Germans invest a lot of time in Christmas. The `weihnachtsmarkten´ attribute to the christmas-feeling of the German population and bring the people together. On the cozy markets you can enjoy a nice cup of glühwein and eat some typical German food. These typical products, the great atmosphere and the easy-to-reach locations make the christmas markets very populair locations for tourists as well. 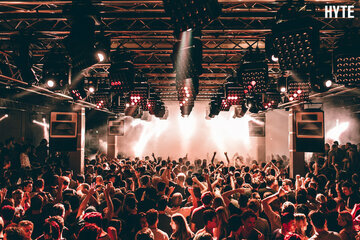 When you decided to visit Germany in December, then Berlin is defenitly one of the best places to be. Although Berlin is a massive city, it will be not easy to find a street without christmas decoration. Besides that, Berlin is host to more than 15 different christmas markets. Located from Charlottenburg to Friedrichshain you will find markets in different sizes and with many different products. Lucky enough the public transport makes it possible to reach all these markets in within a reasonable period of time. 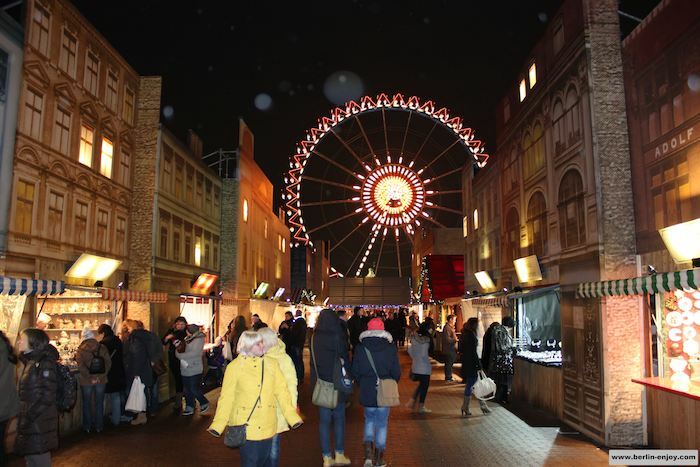 Because some of the christmas markets are located close to the populair attractions in Berlin, it is easy to combine these markets with other day activities. The markets at Kurfurstendamm and Alexa for example, are very easy to reach after an afternoon of shopping. Although combining the markets with other activities saves you time, it will not be possible to visit all the different markets in one weekend . Therefore I made a list with the best christmas markets in Berlin. 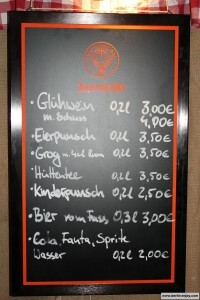 Glühwein: When visiting a weihnachtsmarkt, it is a shame to leave before you tasted some of the traditional glühwein. The word glühwein litteraly means glowing wine. The warm and fruity beverage is perfect for the cold wintermonths and attributes to the special atmosphere of a christmas market in Berlin. 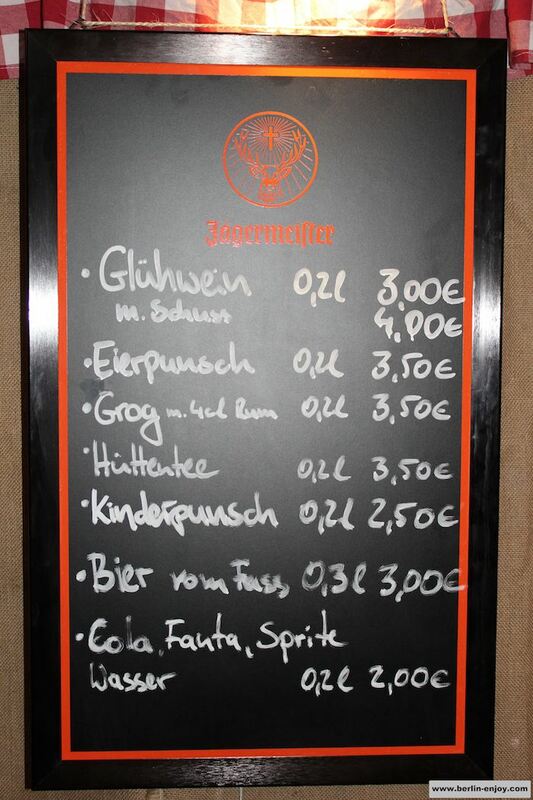 For 0,2l of glühwein you have to pay between 2,50 and 3 euro. Baked Chestnuts: On the christmas markets you will find these chestnuts under the name Maronen. They smell delicious and it is hard to resist them when walking past a chestnut-stall. After they are baked in the traditional way, they taste a little like puffed patatoes. Because Maronen are coming from the forest, they fit perfect in the this cold season of the year. The chestnuts cost about 3 euro for 100 gram. Fried mushrooms: In most countries we use mushrooms (pilze) as an ingredient for many dishes but don´t eat them `solo´. As a visitor of the christmas market this should change. The big brown mushrooms are fried and spiced in a special way and belong on every christmas market in Germany. Just like the chestnuts the cost about 3 euro for 100 gram. Bratwurst: This typical German product can be found all over Germany during the whole year, but also on the christmas markets you can enjoy a nice bratwurst. Besides a sausage you can also decide to eat steak, burger (boulette) or other sort of sausage from the barbecue. For a piece of meat on a bread you pay between 2,50 and 4 euro. Internationale products: On most christmas markets in Berlin you will also find some international products. One of the cool additions are the dutch “poffertjes”. 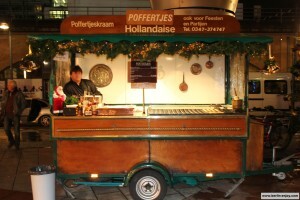 You can find the mini-pancakes on most markets, for example on the christmas market close to Alexanderplatz (see photo). 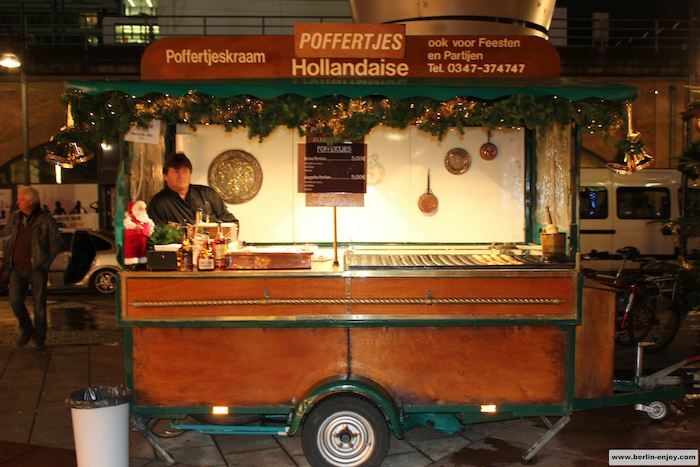 Besides poffertjes, you can also enjoy some pizza, noodles or tapas on many markets. Although they are actually intruders on the list of German products, they still taste very good. Still, as a tourist, I would recommend to taste some of the more special products. On the26th of November most christmas markets in Berlin open their `doors´. About one month later, on christmas evening, most stalls will be gone again. A small bunch of markets will be available till the end of the year but there is not much special going on during the christmas days itself. The opening times of the weihnachtsmarkten vary but most open in the morning around 10.00 and close between 22.00 and 00.00. During the day the markets around shopping areas are most crowded and at night you will find more people walking around on the markets with an icering or a ferris wheel. Especially in the weekend the christmas market in Berlin can become quite crowded. For more individual information about the christmas markets in Berlin you can check the article: The best christmas markets in Berlin.